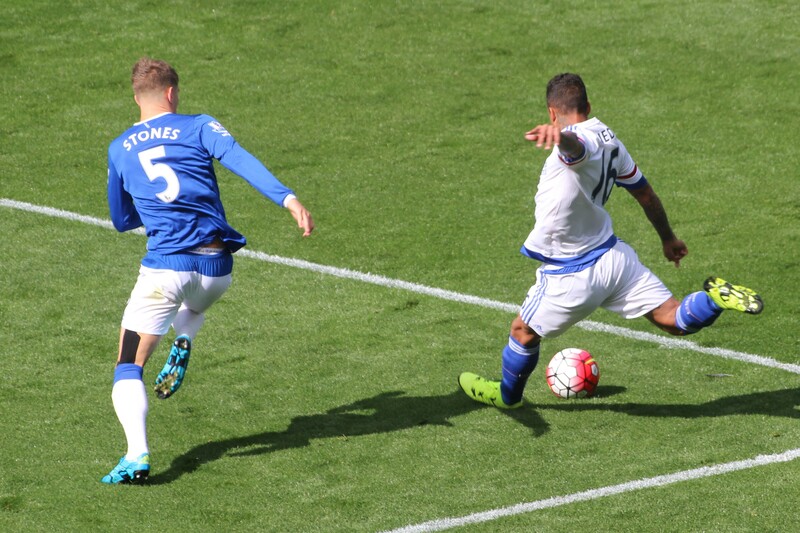 Everton vs. Chelsea : 12 September 2015. With the game petering out in the final few minutes, I spoke to Gary, wanting reconfirmation that our start really was as bad as it appeared. I knew that our imminent 3-1 loss to a tight Everton team would be our third loss in this nascent league campaign, but my poor mind was struggling to believe that we had only played just five games. Losses at City and at home to Palace, then this one. But surely it wasn’t three losses out of five. My mind back-peddled. What were the other two? A win at The Hawthorns and a draw on the opening day against Swansea City. But I still wanted to be convinced. Three losses out of five. 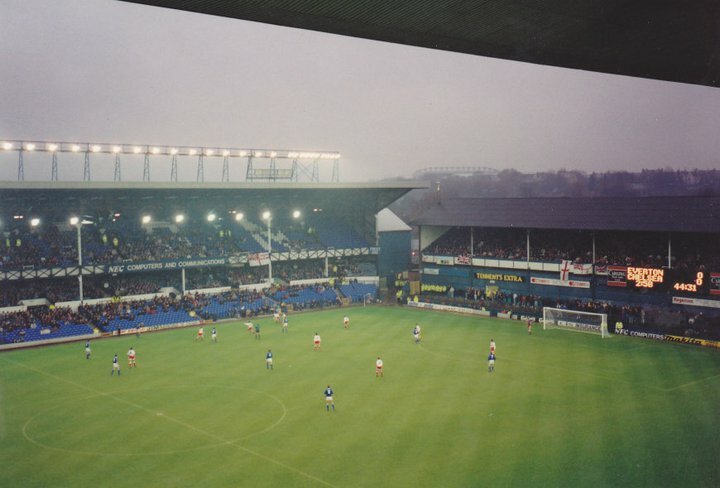 I stood, with my hands in my pockets, leaning against the wall of the upper tier in the Bullens Road stand at Goodison. Fate had decried that Alan, Gary and myself would occupy the first three seats in row D, thus giving us a far from perfect view, way behind the goal line, of the day’s game. I had seat “0001” and so was presented with the worst view of all, with the corner flag on the far corner out of view, behind the stand wall. Yet this was the least of my problems. I absolutely love returning to Goodison Park season after season, for reasons that I have enlarged upon during many other match reports. The poor view was not a problem in the first-half, since all three of us shuffled along a little, taking up empty spaces in our row. 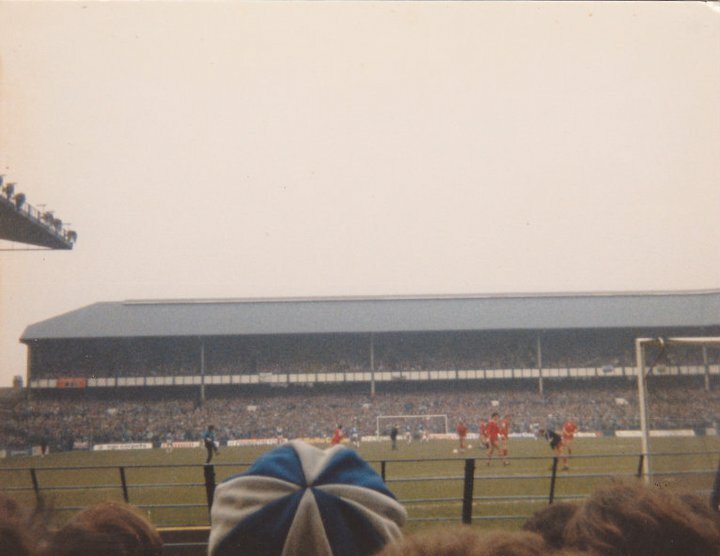 Throughout the second-half I had decided on a different solution; I merely stood on the plastic seat – there was nobody behind me, nobody that I would be annoying – and this afforded me a fine view of the game. It meant I could snap away every few minutes with my camera. The Goodison Park pitch, angled towards me, and backed by those lovely Leitch stands of old, was at times covered in sun, at times coloured in a brooding shadow. At the final whistle, there were no boos from the Chelsea faithful, a few shy of the allotted three thousand. The shouts of anguish had increased after the third goal had been scored, but thankfully there had been no mad, and bad, exodus after the third Everton goal. I was looking for small crumbs of comfort on another bleak day following the Great Unpredictables. At least our support had stayed firm until the end. There had been defiant shouts of support throughout the game, but it was not one of the noisiest away crowds of recent memory. I said my goodbyes to my two closest friends in the Away Club, the ever-present Alan and Gal, and wished them well on their travels back to South London. Gary had awoken at 3.30am for this game, before catching a night bus to Stamford Bridge in order to catch an official Chelsea coach up to Everton. It would be a long, and painful, trip home for them both. I spotted an acquaintance from Texas, who I had last seen during the summer tour, and sidled over to him. I offered a hand to shake, but was unable to engage in a conversation at all. My face must have looked a picture. Neil Barnett was with him, and we shook each other’s hands, again without words being exchanged. It seemed – ridiculous I know – that nothing needed to be said, nor could be said. Neil and myself both had our Marlene Dietrich “I vont to be alone” faces. Three defeats out of five. It kept ringing in my ears. Outside, I soon met up with Dean, who had traveled up for the game with me from deepest Somerset. There was no Parky on this trip; an early evening Madness gig in Bristol had meant that he was unable to attend. We walked, quietly, away from Goodison Park, and back to our waiting car on Utting Avenue, the long and familiar road which rises up from the city by-pass towards Anfield. The Evertonians alongside us were full of it, and quite rightly. Their team had soaked up our possession, and had ripped us to shreds with three fine goals. We had set off at just after 7am with a rather guarded approach towards the day’s game. We were just desperate for us to grab a result, silence the critics, and begin an upward trajectory towards better times. Yet this was never going to be an easy one. Everton are one of the grand dames of English football – exactly the same number of league championships as Chelsea and Manchester City combined – and despite a change in manager after the Moyes era, they have proven to be tough opponents of late. There was a time when Everton’s league positions used to lurch from one extreme to the other (15th in 2002, 7th in 2003, 17th in 2004, 4th in 2005, 11th in 2006), but they have been a consistently-placed team within the top third for many a season. However, our results against them in recent seasons have been rather “hot and cold” and this last defeat follows this pattern. A graph of these recent five games would resemble the Loch Ness Monster. So, it was never going to be an easy one. There was plenty of chat in the car on the way north, of our current malaise, of previous Chelsea experiences, but also of other topics. The weather was overcast and there had been rain at various periods. We drove past The Hawthorns, the site of our last win, and then the Bescott Stadium, where we play Walsall within two weeks. We were making fine time. At around 10am, with the rain steadily falling, there was a moment of drama for the both of us when the car in front began slowing rapidly, but I was able to drive past unhindered. There had been a shunt several cars ahead and the traffic was stalled in the outside lane. In my rear view mirror, as I drove on, a car careered on to the hard shoulder after hitting a car that had slowed too. We drove on, with the sky hinting at a sunnier day ahead. As we drove up Utting Avenue just before 11am, I spotted one of the last “free” parking spaces. We joined a pub full of Chelsea supporters in “The Arkells”, the pub of choice for many at Everton, ironically only a few hundred yards from Anfield. It is highly likely that I have had more visits to “The Arkells” over the last ten years than visits to my local village pub. On the wall, in a dark corner, was a faded photograph of the last Liverpool team to win the league championship in 1990. You would think that the owner would take it down, not wishing to draw attention to it. On the walk to Goodison, two yellow cranes loomed over the steel of the new stand at Anfield, growing quickly behind the existing structure, with the huge roof truss balanced above the existing stand. The top row in the upper tier of the new stand will be ridiculously high. Liverpool are nobody’s favourites within the Chelsea support, but a part of me is pleased that they are redeveloping Anfield rather than looking to move. Outside the main stand at Goodison, I was so pleased to be able to give Dog a warm embrace after his spell away from Chelsea. He was with Cath and Becky; it was a real joy to see the three of them once more. That road underneath the old main stand at Goodison still remains one of my favourite match day locations in 2015. That my father once visited that same street in around 1942 – his only visit to a football stadium until my first game in 1974 – makes my continued visits all the more meaningful. Lampooned and chastised by many, but I continue to love its old charms. I have been lucky enough to have watched Chelsea games from three sides. 1985-1986 : The Park End. 1992-1993 : The Main Stand. 2004-2005 : The Bullens Road. Only the Gwladys Street remains unvisited. I once made it in to the old Kop at Anfield for a Chelsea game in 1992, so maybe one day I will set foot in the Everton home end to complete the set. I met up with Alan and Gary with fifteen minutes to go, high above the enclosure below, with the wooden steps of the Bullens Road stand reminding me of its age, and uniqueness. With Thibaut out, in came Begovic. Ivanovic still at right back, Zouma in with JT. Fabregas pushed forward with Hazard and Pedro. Another lovely moment to savour. First thoughts as the game started were positive. We seemed to be dominating possession, which is the first obvious stepping stone to greater deeds ahead. At the time, the injury to Muhamed Besic after around ten minutes seemed of little importance to anyone within the Chelsea ranks. However, the peroxide white hair of substitute Steven Naismith – as the replacement – caused a few of us to step anxiously from one foot to the other. I was cheered when a couple of timely interceptions by Ivanovic were loudly applauded by us. This was good to witness. We were there to support the team, irrespective of players’ form. The negative comments could wait until after, in bar or internet chat-room, surely. Supporters should, in my book anyway, be there at games to provide a platform of positive noise to spur our players on. Despite enjoying possession – but with only Pedro showing any real urgency – we succumbed to two goals within just five painful minutes. 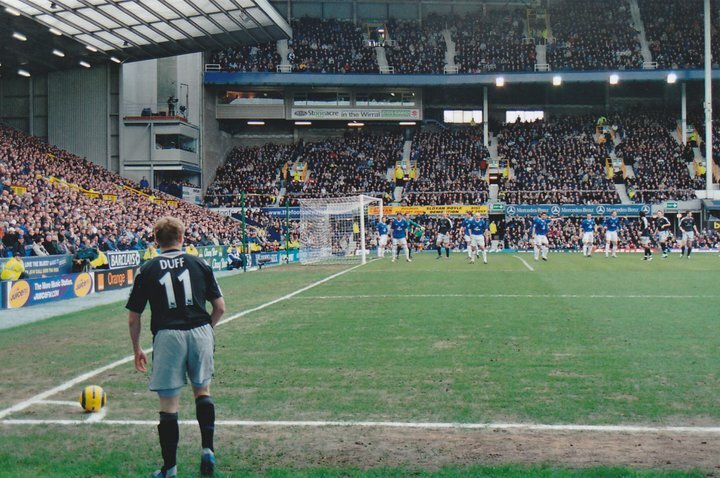 A cross from young Galloway was perfectly weighted for Naismith – yes, him – to nod past Begovic, arriving late and unmarked. It was a huge body blow. The Chelsea support rallied, and were warmed by two spectacular saves from Begovic. However, with Ivanovic backing off, a long range laser from Naismith from outside the box fired Everton into a 2-0 lead. And now the negative noises rumbled around the Bullens Road. We had dominated, but were losing 2-0. I wanted to tell Gary that “they have only had two shots” but there were those two saves too. Everton, then, it was obvious to all were deservedly in front. Azpilicueta hit the side netting, but our play was oh-so laboured, with the usual suspects – Hazard, Fabregas, Costa – quiet. Out of nothing, the ball was played square to Matic. I was right behind the flight of the ball as our Serbian touched it forward and then unleashed an unstoppable blooter past Howard. Surely we would get an equaliser. Soon into the second-half, Mikel was sacrificed as Kenedy entered the fray. Fabregas dropped back alongside Matic, where – truth be told – he played an even more withdrawn role in more ways than one. Mikel had been one of our better players to be fair but I understood why Jose changed it. A few chances for Everton ensued and the Chelsea supporters continued to bemoan our play. The support became more disjointed. However, the Everton fans, despite seeing their team winning, were ridiculously quiet. Again, Pedro been one of our better players. A more worthy substitution in my book would have been the misfiring Hazard. A back-pass by JT to Begovic was not rewarded with an Everton free-kick, which let us off the hook. Only rarely did we threaten the Everton defence, where young John Stones looked remarkably comfortable alongside Jagielka. I can see why a bright future is forecast for him. Hazard only buzzed past his marker on a few occasions. A header from Falcao, a run and heavy touch from Costa. I couldn’t fathom the new formation, but I didn’t waste time trying. I was focussed on the game, trying to will the boys on. Further calamity, however, as Barkley – I think –played in Naismith in the inside right position, and he beat Begovic with a low drive. That his run was not picked up by anyone was typical of our defensive frailties all season long. At last the Everton support roared. In the closing minutes, all was quiet in our section. Truth be told, I was lost in thought, trying to put some sort of reasoning or rationale behind our ridiculous start to the season. I won’t lie, I hated it. So many players under performing, so little fight, so little enjoyment. I do not have any FA coaching badges, nor am I a sport psychologist. I’ve never even played FIFA, so what chances have I got to come up with any reason for all this? Like a shy and awkward teenager at a school disco, I just can’t put my finger on it. All I can do is to pay little attention to those who have lots to say and yet say nothing, and to look after my own little group of respected and cherished Chelsea mates. Sometimes the noise and nonsense espoused by some Chelsea supporters is just not worth the bother. It still keeps ringing in my ears. This entry was posted in Season 2015-2016 and tagged 2015-2016, Everton, Goodison Park, Stadia by Chris Axon. Bookmark the permalink.